View More In Straps & Strap Locks. With a beautiful custom strap handcrafted in our own shop, cut from the finest #1 grade leathers we can find; sweet, smooth topgrain top and bottom. * Interior of strap has layer of special foam padding- Super Comfortable! * Adjusts to fit anyone; from 43" (hole to hole) at shortest setting to 54" at longest. (Special lengths by request). * Width: 2 inches at top; gently widens to 3 inches at bottom. 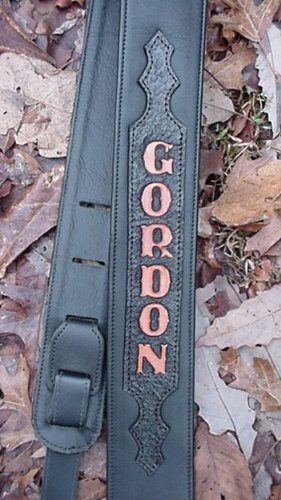 * Ain't no import cheapie- We have made these fine straps for years for our musical customers the world over (including George Jones, Lynyrd Skynyrd, Aerosmith and a host of others...); you'll love it! Also makes a beautiful, lasting, and thoughtful Gift. Buyer can submit up to 10 letters for name. (We can do more letters, but they will be smaller, 3/4" instead of standard 1"). Symbols available: Musical Notes, Star, Cross, others as shown in pix. 1) Choose your Strap Color: Main body of strap can be done in Black, Dark Brown, or Light Brown. 2) Choose the Letter area Overlay: Black, Dark Brown, or Light Brown. 3) Choose your Letter Color: Standard Saddle Tan, Red, Blue, Yellow, Green, Black, White, Gold, or Silver. You can email your choices accompanying payment, or email directly to bobkitchener@aol.com; or call us on the phone at 1-800-678-6808 to discuss the options. * Proudly Handcrafted in the USA by Dangerous Threads, Nashville, TN. Our 20+ years of manufacturing experience assures you Top Quality Merchandise. * Please allow 2 to 3 weeks lead time for expert custom work. Regular Retail for this kind of quality would be triple the price or more! Interior of strap has layer of special foam padding- Super Comfortable! Please allow 2 to 3 weeks lead time for expert custom work. If you have any questions about this product by Dangerous Threads, contact us by completing and submitting the form below. If you are looking for a specif part number, please include it with your message.